Following Reggie's slot on the Jimmy Fallon show, the man himself took a stroll down to Nintendo World Store in NYC, where he stumbled upon 50 campers outside gearing up for Wii U's midnight launch. Reggie had some fun with the fans in the queue, where he was taking note of what fans wanted to see on the system (Smash Bros. and Metroid were mentioned), and searched for Triforce Johnson - who seemed to have been missing from the queue at the time. Apparently Johnson was getting a 'power up' in preparation for tonight's madness. Keep an eye out for our launch day coverage tomorrow, and we'll be expecting you to join in. Reggie would be the best Mii to get for StreetPass Quest! The man would never tire! People gon murder the poor man for makin dem poor, nintendo puts out great games all the time. 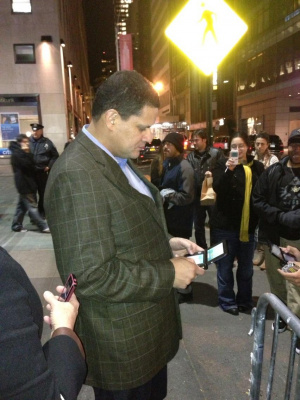 I would love to meet Reggie and StreetPass him. Nice one, Reggie! I would have started to scream with excitement..
That was really cool of him. Puts a smile on me face. Reggie must be one of the only CEOs to get that sort of reception just for turning up! Metroid for Wii U.. Calling it now..
Or Metroid Prime is one of the downloadable Gamecube games launching with the Wii U tomorrow. @Lan Yeah you would never see a Sony or Microsoft CEO stand on the streets with the fans like that they aint as cool as the Regginator. @baba_944 That would be incredible..
That's crazy, only Nintendo would do that sort of thing. It's not like he just 'stumbled' upon them he knew they'd be there! It's the small things like this that make me love Nintendo! @MadAussieBloke - this feels like a bit of a warm-up for us in Oz, hey? Not that I can imagine Reggie being outside of EBGames in Hay Street (Perth) hanging around to hand me my Wii U in two weeks time. I seem to have got over my region-envy quite early and am anticipating the US release almost as much as if I was there myself. @dudey300 Wait, you're in that line? My body so wants to be ready. I can afford this for a few years! Ha ha, even Reggie hates having to clear out his Plaza every 10 people. Actually, he seemed considerably nicer in this video than I thought he was. My body is always ready! @Schprocket Yeah I can't wait to receive my WiiU from the same sad Xbox360 fanhead at EB that handed over my Wii, 3DS & XL it might not be Reggie but I take pleasure from watching this Microsoftboy die inside. Good ol' Reggie. It's nice to see that he genuinely cares about the fans. When he asked what people wanted to see on Wii U, I would have screamed "STARFOX!!!! F-ZERO!!!!! WAVERACE!!!!!" at the top of my lungs!! But Reggie is the man! Monster Hunter is way less predictable than starfox. There always has to be that one person that ruins the fun by complaining (the lady talking about Project X Zone). Thats it,i'm moving where the WorldStore is! I loved the reactions the people made when they realized who showed up. I wish I could see Reggie in person for a game system launch. My body is ready for tomorrow! It's hard not to love this guy. I must admit im starting to warm up to Reggie. Remember after e3 people, including my dumb were inraged with Nintendo s showing and i think reggie took a lot of the brunt. Now that i see nintendo s bigger picture i think they have done a good job selling the wii u and reg has done a great job here in north america. [email protected] want to make a bet? Not only does Reggie drop by to chat, he rips out his 3DS and hangs out too. Thats one of the awesome things about Nintendo, they make time for their fans. Has anybody here streetpassed him? DOES HIS GREETING SAY "MY BODY IS READY!"? Metroid, Zelda, Starfox, and a 3-D Mario have all been confirmed for Wii U in my book. That was pretty neat, really cool of Nintendo to do that, reminds us that they are people just like anyone else. I found it hilarious that the one girl took time to actually complain to Reggie about Project X Zone. She's probably one of the 5 members of Operation Rainfall left. I like that EB employs Gamer-Grrls as well but sadly there's none my age - and I think they all assume I'm buying for grand-kids- lol! Wow Reggie, superiority Complex much? Miyamoto is enormously humble compared to this guy. Then again, Reggie always seems a lot more natural and friendly whenever he's being interviewed....Here it just seems a bit fake, almost like the fans are beneath him. But i understand that it's all part of his sales pitching NintenCelebrity reggienator image.Too bad Howard never popped out in his classic NintenSuit and Bow Tie. Reggie's got nothing on that man! maybe metriod prime triology for download day launch? or free? I wish the people had asked about Monolith Soft's next game coming to US same time as Japan and for some follow-up to F-Zero, Eternal Darkness, and Geist. We all already know that Metroid, Zelda, etc. are coming so wasting requests on those is pointless. I am intrigued by the emphasis on Metroid with today being 10th anniversary of Metroid Prime and mention of Metroid Blast with Jimmy Fallon, Nintendo Direct, etc.